You can now switch agents to a rag doll state. The Collision Layer and Configure Joints tools on the Crowds shelf tab let you set up collision geometry and joint rotation limits for rag dolling. The Bullet solver solves the ragdolls. You can use standard DOPs techniques to alter constraints, for example to have agents drop objects or detach limbs. 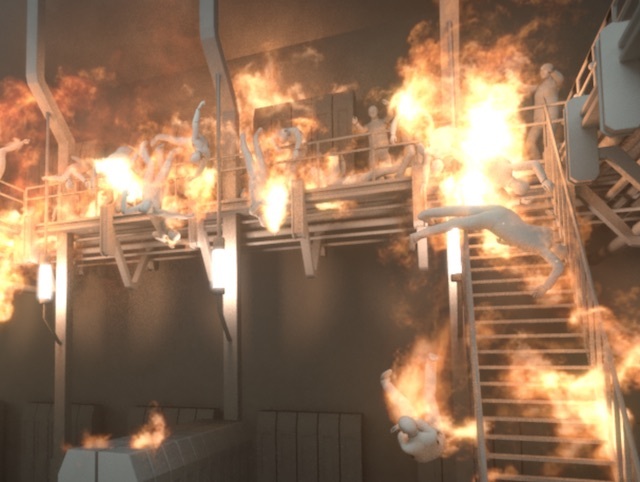 Ragdolls interact with other simulation types such as FLIP fluids and POP grains. Houdini now has DOP and VOP nodes to allow creating fuzzy logic "brains" to drive agent behavior. Support for subsumption logic allows better collision avoidance and more natural turning. Terrain adapation now supports an arbitrary number of lower limbs. Agent Layer geometry node can now add deforming shapes to the layer. Option on Crowd Source geometry node to randomize each agent’s current shape layer. New Keep external references parameter in the Agent and Crowd Source geometry nodes lets you choose whether to reference agent definition files on disk. Turning this off allows self-contained (but larger) geometry files when you export agent primitives to disk. The Agent ROP can now write out agent definition files for an existing agent primitive. Added support for orientation when converting agent clips to in-place animation in the Agent render node. Changed agent network structure to allow modifying agent primitives (for example, adding ragdoll metadata) before sourcing them. New Start clip at frame 1 parameter on the Agent geometry node and Agent render node bakes clips starting at frame 1. This defaults to true on new nodes. Added parameters for pre-render and post-render scripts to the Agent render node. Agent Cam tool creates a camera and attaches it to the head of an agent for point of view shots. Target Position tool makes agents move toward a target. Deforming agents now properly occlude other geometry. You can now set the view pivot on deforming agents using Space + Z. The base discs of agents in the selected object are now drawn selected. Agent shapes with primitive color (Cd) attributes are now colored in the viewport. Previously only point, detail, and vertex Cd attributes were supported. Material stylesheets allow you to change materials and material parameters per-agent. The Agent Mantra Procedural shader is now available if you need to override default settings for rendering agents, for example level of detail (LOD) settings. New VEX functions agentlocaltransform, agentworldtransform, setagentlocaltransform, setagentworldtransform for reading and writing specific agent transforms. These are much faster than functions such as agentlocaltransforms that work on all an agent’s transforms. The Agent Add Clip VOP lets you add clips to an existing agent. This is a wraper for the agentaddclip VEX function. The default for converting animation to in-place when baking clips is to place the agent at the origin (instead of at the position in the first frame). To get the old behavior, turn on Use pivot from first frame on the Agent SOP and the Agent render node. The Agent and Crowd Source geometry nodes now generate warnings if clips have different numbers of channels, to help diagnose naming or overwriting problems where a clip was baked with a different rig. Agent locomotion transforms are now called __locomotion__. Renamed Start clip at frame 1 to Shift clip to frame 1 on agent nodes. The Agent nodes now always bake out agents with the __locomotion__ rig transform. If the Locomotion node parameter is empty, it uses the Object subnet. You can now turn off Update Particles on the Crowd Solver node to disable its internal particle solver. This allows you to use the node as a microsolver. Houdini now supports deforming curves in packed agent geometry. Faster playback for crowds in file caches that use external file references. In one case, playback went from 4 FPS to 15 FPS. The Agent Look At and Agent Look At Apply DOP nodes are much faster. The Agent SOP now warns when loading a layer definition with an invalid shape binding, instead of continuing in an inconsistent state and possibly crashing.